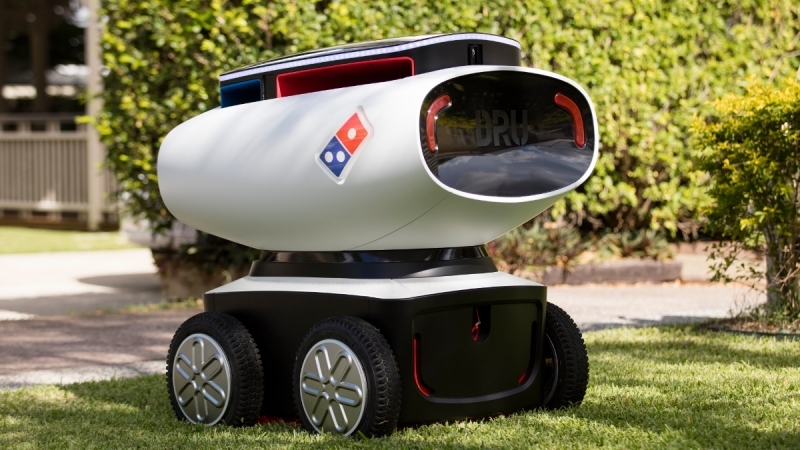 Domino’s Pizza has unveiled the world’s first “autonomous pizza delivery vehicle.” The four-wheeled robot, known as DRU (Domino’s Robotic Unit), was developed in collaboration with Australian technology startup Marathon Targets, which specializes in creating moving robotic targets used in military live-fire exercises. DRU uses a Lidar system, the same technology found in self-driving cars, to navigate fences and avoid obstacles. It also comes with a built-in GPS tracking system that syncs with Google maps, allowing the robot to travel to an address. The $23,000, three-foot machine can complete deliveries within a 12-mile radius on a single charge. It’s able to carry ten pizzas at a time, which are protected from the elements in custom-built, watertight and weatherproof heated compartments. As a safety feature, customers have to input a security code, provided by Domino’s, to open DRU’s hatch and take their orders. Each DRU unit will also come with a number of IP cameras, in case someone decides they want to steal or vandalize the robot. Domino's CEO and Managing Director Don Meij said that DRU has already completed several deliveries in restricted streets in Brisbane, approved under special permit by the Queensland Department of Transport. Domino’s says it’s working with “global partners” to ensure the robot meets safety requirements for testing in other areas. Meij insists that DRU isn’t a way of replacing traditional human drivers, but will simply offer another option; there’ll always be certain deliveries that DRU will be unable to complete. “I think drivers are going to be around for a long time,” Meij said. It’ll be quite some time before DRU robots become a common site in Australia, and even longer before they reach everywhere else, but with more companies, such as Amazon and Walmart, turning to autonomous vehicles for deliveries, will we eventually have to start tipping machines?